Jacob was an unemployed college grad struggling to find a job. The interviews he was getting had no relevance to the 4 years he’d put towards his degree, so Jacob decided to reevaluate his career path. 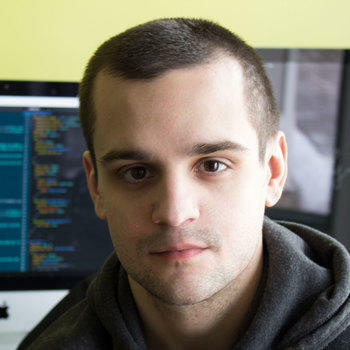 He chose to prepare himself for the tech industry by learning in-demand coding skills, guaranteeing him job prospects. Jacob chose Treehouse for its cutting-edge and in-depth curriculum that would help him stay up-to-date with industry demands and expectations. He began applying his new skills to real world projects as an intern at web design and development agency, Elegant Seagulls. 3 months later, after proving himself a valuable asset, Jacob was offered a permanent position. The next challenge for Jacob is to master new languages, expand his skills and open up future opportunities for himself. We asked Jacob to share more about his learning experience and advice for new students who are just starting to learn to code. I knew how to design but I didn’t know how to develop. That was a big issue when it came time to put together a portfolio. Throughout four years of college, I tried countless template sites and portfolio systems but nothing ever hit the spot. I kept wanting more customization and flexibility. I also hated the idea of having to use a slider or drop-down menu to change something. Honestly, I was jobless. I wasn’t getting any work several months out of college. Good grades and a small portfolio only landed me a few interviews. One was at a popular 3D printing company in New York and the other was at a small screen printing business in Wisconsin. Neither had any relevance to my education. I joined Treehouse around the same time I decided to go back to school to study Computer Science. In my mind, I wanted a platform that allowed me to stay ahead of the classroom and other students. Most importantly, I wanted to be up-to-date. You’d be surprised how far behind some college professors are. You recently landed an internship at a web design and development agency. Tell us a little about the experience and the work you’re doing now. My internship at Elegant Seagulls was very beneficial. It provided an insight into the industry and how inefficient I was. There was so much to catch up on and I was dead slow. Over three months, I worked with clients, designed logos, pushed content, mocked up a pretty sweet Alien website, fell into a relationship with Sass, and was hired on full-time. Most recently, I was tasked with my first build. It’s been a thrill seeing a site come to life. Treehouse is a powerhouse of relevant up-to-date information. That is essential to someone like me. In a rapidly changing industry, I love having a resource that continuously educates me with what I need to know. I can confidently say that I wouldn’t have my job or pass any of my recent Java exams without Treehouse. With that said, it’s also crucial to practice and study. Once you finish a course on Treehouse, experiment with what you’ve learned, a lot. Just because you followed along with a video doesn’t mean you truly grasp the material. If you’re learning Java, do you know what a Java program is? Or the difference between a parameter and an argument? Ask yourself those questions. Make sure you understand what you’re coding.